1994 Harvard Student: Nigeria’s Democratic President Was Overthrown. He Was My Dad. Here's Why the U.S. Did Nothing. Hafsat Abiola was walking on campus one day in 1994 as a student at Harvard University when she was summoned by a group of students who were collecting signatures for a petition. “There’s an elected president in jail in Nigeria and we’re gathering signatures to demand his release,” one of them said to her. It brought Hafsat Abiola to tears. The celebrations, however, were short-lived. 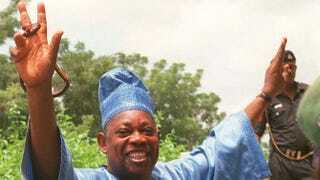 Nigeria’s military challenged the election results, overthrew Moshood Abiola’s pending administration and threatened anyone who opposed the new military regime. But it was too late. Nigerians had already gotten a taste of democracy. That their new democracy was being yanked from them so recklessly ignited a firestorm. People took to the streets to protest the military coup. Moshood Abiola traveled the world to bring attention to the political crisis. He made it all the way to the White House to encourage the international community to put pressure on the Nigerian military so that it would step down and allow his civilian administration to take hold. He returned to Nigeria and was soon captured by military soldiers and jailed. Civil rights activists in Nigeria and abroad—much like those students at Harvard—demanded that he be released and reinstated as president. This watershed moment in Nigeria’s history is fleshed out in a new documentary called The Supreme Price. It’s a fascinating history lesson about the country and gives a compelling account of how Moshood Abiola’s senior wife, Kudirat Abiola, and their daughter, Hafsat Abiola, risked their lives to reinstate Abiola and fight for the pro-democracy movement in modern-day Nigeria. One of the film’s most poignant themes is an idea that’s underdiscussed: that Nigeria did not receive adequate assistance from the United States when its democratically elected leader was being toppled by the military. In the documentary, Hafsat Abiola is still reeling from that as she describes how the U.S. government did little to support her dad’s efforts during Nigeria’s political crisis. The reason she says the U.S. didn’t support her father still annoys her, too: Nigeria is one of America’s top oil suppliers, and the military controlled the country’s oil patches at that time. Ouch. It’s an allegation that is backed by Walter Carrington, the U.S. ambassador to Nigeria from 1993 to 1997, who described how he received word from the State Department “to remain neutral” during the unrest. America has made a huge fuss about wanting other nations to democratize, but many people, like Hafsat Abiola, believe that America merely watched while a democratic election was delegitimized in Nigeria in 1993. That The Supreme Price is being released this year is serendipitous given Nigeria’s prominence in the news: the schoolgirl abductions by Boko Haram, the country’s kidnapping crisis in general and the corruption surrounding the wealth of the Nigerian economy. As the film unfolds, viewers can’t help but connect the dots between the current conditions in Nigeria and the neglect by the West during a time when Nigeria needed international help the most. With all of those Save Africa initiatives in the U.S. and the United Kingdom, one might have expected the West to support a democratically elected African leader that might save Africa. If Moshood Abiola had received assistance in 1993, he might have implemented economic policies that would have helped ordinary Nigerians benefit from the country’s oil profits—not just a select few. Also surprising, I found, is that The Supreme Price seemingly makes the case for a key tenet of conservatism: If Nigeria’s oil industry were privatized—and not nationalized—politics might not be such a hotbed of corruption. “There’s one source of revenue [in Nigeria], and that’s oil,” Wole Soyinka, a Nigerian playwright and political activist, explained, “and there’s one organ controlling that revenue, and that’s the government. “You have a cabal of individuals whose entire understanding of national development is to be as close to this single source of revenue as possible,” he continued. That point, threaded throughout the film, provides a nice explainer for Westerners who can’t wrap their heads around why some countries are still teetering between democracies and dictatorships. The documentary gets its title from Kudirat Abiola, who said she was willing to pay the “supreme price” to carry on her husband’s mission after he was jailed. The documentary also highlights Nigeria's blossoming feminist movement and how Nigerian women like Kudirat and Hafsat Abiola carried the torch for democracy. But all of that plays second fiddle to the compelling accounts of military coups, assassinations (in 1996 Kudirat Abiola was killed by armed robbers believed to be sent by the military), street protests, civil unrest, and appearances by influential people like Nelson Mandela and former United Nations honcho Kofi Annan, who were both seen commenting in old news footage. Viewers should feel inspired by the work that Kudirat Abiola and many Nigerian women, past and present, have done to strengthen Nigeria. One gets the sense that Nigerian women are itching to live up to their fullest potential and help Nigeria be the best country it could be. But I was left wondering if Hafsat Abiola is, in fact, living up to her fullest potential after hearing her brother say that although she would be a great senator or governor, she shouldn’t run for president in Nigeria because only men should do that job. Please. If Hafsat Abiola governs the same way that she manages KIND, her nonprofit organization that is developing young female leaders in Nigeria, then she’d make a great candidate. It would certainly be nice to see her fulfill her dad’s legacy. (Moshood Abiola died in jail in 1998.) Plus, she’d be Nigeria’s first female president. Hillary Clinton for 2016, and Hafsat Abiola for 2015?